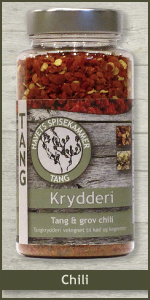 Seaweed & coarse chili is a new and exciting version of spice for you, that loves the spicy, but at the same time want a new dimension of this classic spice. The seaweed gives the spice a salty character. The bottle contains 65 gr.